Salute to Italian Women in America | Italian Heritage & Culture Committee, Inc.
Aiello, Barbara (b.1947, Pittsburgh, PA) Italian Jewish heritage; first and only female rabbi in Italy, as well as Italy’s first non-Orthodox rabbi. Angelica, Mother (Rita Antoinette Rizzo) (1923-2016) born in a ghetto of southeast Canton, OH; was a Franciscan nun, who in 1980 founded Eternal Word Television Network (EWTN), a network viewed regularly by millions of Catholics. Bambace, Angela (1889-1995) born in Brazil to Italian immigrant parents, immigrated to New York City when Angela was a young child; in 1956, became the first Italian American woman elected as vice-president and only woman as a member of the General Executive Board of the International Ladies Garment Workers Union (ILGWU) during her sixteen years in office. Bartiromo, Maria (b.1967, Brooklyn, NY) an Italian American television journalist and anchor, magazine columnist and author; host of Fox News’ Mornings with Maria and Maria Bartiromo’s Wall Street; first reporter to broadcast live from the floor of the NY Stock Exchange. Bastianich, Lidia celebrity chef, television host, author, restauranteur and co-owner with her son of Eataly emporium in New York; along with Angelo Vivolo, chosen chefs for Pope Benedict and Pope Francis during their celebratory visits in U.S.
Belloni, Alessandra (b.1954, Rome, Italy) artistic director, founder and lead performer of I Giullari di Piazza, an Italian music, theatre and dance ensemble; the only woman in U.S. and in Italy who specializes in traditional Southern Italian folk dances and percussion combined with singing. Cabrini, Saint Frances Xavier (1850-1917) Italian American religious sister who founded the Missionary Sisters of the Sacred Heart of Jesus, a Catholic institution that was of major support to Italian immigrants; the first naturalized citizen of the United States to be canonized by the Roman Catholic Church (on July 1, 1946). Cristoforetti, Samantha (b.1977, Milan, Italy) engineer, one of the first female Italian Air Force fighter pilots and astronaut; first Italian woman in space, holding the record of longest uninterrupted space flight of a European astronaut; as a foreign student, at 18 years, came to the U.S. to attend Space Camp, being its second alumnus to be in orbit. Cuomo, Matilda Raffa former first lady of the State of New York; inducted into the National Women’s Hall of Fame in 2017; long-time advocate for women, children and families; founded Mentoring USA, which began as the first statewide school-based one-to-one mentoring program in the U.S., ultimately becoming a national and international program; co-led with husband, Gov. Mario Cuomo, “Due Case Una Tradition,” fostering appreciation of Italian language and culture and initiatives in the fields of economics, science, technology, health and education for positive relations between Italy and U.S., collaborating with many notable persons, including playwright Mario Fratti. DeAngelis, Catherine D., M.D., M.P.H. (b.1940, NE Pennsylvania) University Distinguished Service Professor Emerita; professor of pediatrics emerita at the Johns Hopkins University School of Medicine and professor of health policy and management at the Johns Hopkins Bloomberg School of Public Health; first woman and first pediatrician to become editor of the Journal of the American Medical Association (2000-2011). de Francisci, Maria Teresa Cafarelli (1898-1990) the model for Miss Liberty Peace Dollar, minted yearly from 1921 to 1928 and again in 1934 and 1935 as a commemorative of peace, virtually the last true silver dollar; born in a town south of Naples, came to the U.S. at around 4 years old with her mother in steerage class, lived in Clinton, MA, and was the first Italian American woman to graduate from the local high school. De Stacy Harrison, Patricia president and CEO of Corporation for Public Broadcasting; included in Forbes’ 2012 list of Women Changing the World in Media; Chair, NIAF Board Officers. DiFiore, Nancy Quinn in 2007, became the first woman to be elected president of the New York State Order Sons of Italy in America (OSIA) since its founding in 1905. Falletta, JoAnn (b.1954, Brooklyn, N.Y.) began her career as a guitar and mandolin player; first woman to become a permanent conductor of a major symphony orchestra, with both the Virginia Symphony Orchestra and the Buffalo Philharmonic Orchestra; recipient of many awards with 100 world premieres to her credit. Ferraro, Geraldine (1935-2011, b. Newburgh, N.Y.) congresswoman; first woman ever to run on a major party’s ticket in a U.S. presidential election. Fili-Krushel, Patricia (b.1953, NY) American businesswoman and media executive, the first woman president of ABC Television. Forese, Laura, M.D., M.P.H. executive vice-president and COO of highly rated New York Presbyterian Hospital and its regional network; oversees multiple campuses of this academic medical center, with more than 2,600 beds, 2,000,000 outpatient visits, 6,500 affiliated physicians and 25,000 employees in 2017; serves as chairperson of the National Institutes of Health (NIH) Clinical Center Research Hospital Board and Trustee of Princeton University; one of the nation’s leading experts in hospital administration, named among the top 25 COOs in the U.S. by Modern Healthcare and among the 50 most powerful women in New York by Crain’s Business. Gambino, Josephine, Commissioner (d.2000) past president of the NY State Civil Service Commission, appointed by Hugh Carey in 1977; served on numerous commissions and associations, including the State Commission on Judicial Nominations and as vice-president of the Coalition of Italo American Associations. ; recipient of numerous awards and honors, including an Honorary Doctor of Civil Law Degree from St. John’s University. Garibaldi, Marie Louise, Justice (1934-2016) first woman to serve on the New Jersey Supreme Court, the state’s highest court; and first woman to serve as president of the New Jersey State Bar Association. Grasso, Ella T. (1919-1981) born in Connecticut to Italian immigrant parents, first woman governor of Connecticut and first woman to be elected governor without having been the spouse or widow of a former governor. Green, Rose Basile, Ph.D. (1914-2003) an American scholar, poet and educator; among her publications: the first major scholarly study of Italian-American writers, titled The Italian American Novel: A Document of the Interaction of Two Cultures (1974) and several volumes of poetry, specializing in the sonnet form; co-founder of Cabrini College in Radnor, PA, and the first chairman of its English department. Ignani, Karen (b.1954, Providence, RI) former CEO of American Health Insurance Plans (AHIP), formerly Health Insurance Association of America (HIAA), an umbrella organization representing all major HMOs in the country (1993-2015); president and CEO of Emblem Health, as of September, 2015. Impellizzeri, Irene, Ph.D. (1922- 2009) former vice president of the NYC Board of Education and served as professor of educational psychology and dean of education at Brooklyn College; a vocal proponent of multi-culturism and bilingual education. Levi-Montalcini, Rita (1909-2012) joint recipient of a Nobel Prize in Physiology or Medicine for her work in neurobiology (the first recipient to reach 100 years of age); studied/conducted research in both the U.S. and Italy. Lopiano, Donna (b.1946) athlete, sports commentator, consultant; president and founder of Sports Management Resources, a consulting firm that brings the knowledge of experienced, expert former athletics directors to assist scholastic and collegiate athletics departments in solving their growth and development challenges; former CEO of the Women’s Sports Foundation (1992-2007), focusing on ensuring athletic departments’ compliance, throughout the nation, with Title IX regulations; athletic career began at age sixteen with her joining the Connecticut Brakettes, a national championship women’s softball team; participated in 26 national championships in four sports, a six-time National Champion, nine-time All-American and three-time ASA Softball MVP; a member of thirteen halls of fame; in 1975, became the first Director of Women’s Athletics at the University of Texas. Lorch, Maristella de Panizza (b. 1919, Bolzano, Italy) professor emerita at Barnard College where she was founder/chairman of the Medieval and Renaissance program, founder/director of the Center for International Scholarly Exchange, director at Casa Italiana, Columbia University, and founding director of the Italian Academy of Advanced Studies in America, becoming its founding director emerita and director of external relations. Loren, Sophia (b.1934, Rome, Italy) first woman actress to win an Academy Award for a non-English speaking role (Two Women 1961). Lupino, Ida (1918-1995) an English-American actress, screenwriter and singer, who became a pioneering director and producer—the only woman working within the 1950s Hollywood studio system to do so; with her independent production company, co-wrote and co-produced several of her own social-message films; the first woman to direct a film noir, The Hitch-Hiker, which also had an all-male cast (1953); the only woman to direct episodes of the original Twilight Zone television series and the only director to star in the show; member of the Lupino theatrical dynasty dating back to the Italian Renaissance. Magnani, Anna (1908-1973, b. Rome, Italy) first Italian woman to win an Academy Award for best actress in her first English speaking role in an American produced movie, based on American playwright Tennessee William’s play, The Rose Tattoo (1955). Marshall, Penny (Masciarelli) (b. 1943, Bronx, NY) American actress, director, producer; one of the first women directors in Hollywood; first female director to have a movie gross over $100 million dollars at the box office (Big), followed by a second hit grossing over $100 million dollars (A League of Their Own) about the real life All-American Girls Professional Baseball League. Mastandrea, Linda born in Chicago, Illinois; a disability rights lawyer, director of FEMA’s Office of Disability Integration and Coordination since 2017, a Paralympian and author; diagnosed with cerebral palsy at age three years, went on to compete in wheelchair racing while at the Univ. of Illinois, becoming a two-time Paralympian, winning gold and silver medals in track at the 1996 Paralympic Games; also represented U.S. at three World Championships, the Pan American Games and the Stoke-Mandeville Wheelchair Games, winning fifteen gold and five silver medals, and setting national, world and Paralympic records numerous times. Minnelli. Liza (b.1946, Hollywood, CA) singer, actress, dancer; one of few people to receive an Oscar, Emmy and (3) Tony awards, also received a Grammy Living Legend Award. Montessori, Maria, M.D. (1870-1952), b. Chiaravalle, Italy) began breaking barriers from the beginning of her educational career, aspired at first to become an engineer and later became the first woman to enter medical school in Italy; best known for her research, teachings and philosophy, which developed into the Montessori Method and which influenced practices for teaching and learning throughout the U.S. and the world; earned two Nobel Peace Prize nominations. Oricchio, Elisa (b.1979, Vallo della Lucania, Italy) a cancer researcher; at Memorial Sloan Kettering Cancer Center, NY, made the significant discovery that follicular lymphoma tumor cells died when treated with an antitumor protein, which could lead to a cure. Pardo, Marian founded Virtual Capital Management, LLC in 2007 and has been its managing director since then; served as managing director and portfolio manager of Credit Suisse Asset Management (2003-2006), and as its co-manager of the U.S. Large and Mid-Capital Growth Equity; in 2018, became the first female president of the Columbus Citizens Foundation. Pascale, Rosa Capaldo (1916-2009, b. Brunswick, NJ) community activist and leader; moved with her parents to East Harlem when she was three years old, leaving school after eighth grade in order to help her family; married community leader, Pete Pascale, in 1938 and spent most of her life in service to the community; honored for six decades of community service in 1998 by then Manhattan Borough President Virginia C. Fields and in 1999 by then Mayor Rudolph Giuliani for her service to the people of East Harlem. Passonno, Nicole Marie Stott (b.1962, Albany, N.Y.) American engineer and NASA astronaut who served on historical space expeditions and missions; earned numerous awards and honors; one of the first women to go into space as an astronaut. Pelosi, Nancy (b.1940, b. Baltimore, MD) American politician serving as the Minority Leader of the U.S. House of Representatives, since 2011; previously, served as the 52nd House Speaker (2007-2011), the only woman to do so; attained the highest political office of any female politician in American history; first woman, first Californian and first Italian American to be Speaker of the House. Peruggi, Regina S. (b.1946) an American educator; president of Kingsborough Community College in New York City (2005-2014), being the first lay woman to hold that position in the college’s forty year history; previously, served as president of Marymount Manhattan College. Piomelli, Rosaria Agrisano (b. 1937, Naples, Italy) an architect in the New York area; first woman to hold the post of dean of any school of architecture in the United States, being named as dean at CCNY Architectural School from 1980-1983. Ponselle, Rosa (Rosa Melba Ponzillo) (1897-1981) born in Connecticut, was the first female American (and Italian American) opera singer to be born and trained in the United States; in 1918, at age 21 years, making her debut at the Metropolitan Opera with Enrico Caruso in La Forza del Destino; in 1931, she and Caruso, among those who inaugurated the Metropolitan Opera’s first national radio broadcast of an entire opera live from the Met. Porco, Carolyn C. (b.1953, Bronx, N.Y.) American planetary scientist, known for her work and breakthroughs in the exploration of the outer solar system, beginning with her imaging work on the Voyager missions to Jupiter, Saturn, Uranus and Neptune; world recognized expert in planetary probes, leader of the imaging science team for the Cassini probe, presently in orbit around Saturn; recipient of many awards and honors, including being named as one of the 18 scientific leaders of the 21st century by The Sunday Times of London. Prisco, Anne M., Ph.D. president of Felician University, NJ. ; its fifth president; the first appointed in twenty-eight years; and the first lay person as president of this university. Quintavalle, Natalia, Minister (b.Pietrasanta, Italy) first woman to be assigned as Consul General of Italy in New York (2011-2016); her diplomatic career spanning over three decades, served also in N.Y. previously at the Permanent Mission of Italy at the United Nations (2004-2007); entered diplomatic service in 1986 when only 5% were women. Ragusa, Olga, Ph.D. (1922-2018, b. Catania, Sicily) Da Ponte professor emeritus of Italian at Columbia University and cultural icon in Italian studies and publishing in America; author of a comprehensive Italian grammar text and among the first critics to introduce American readers to the 19th and 20th century writers who shaped the Italian language and national culture, such as Alessandro Manzoni, Giovanni Verga, Luigi Pirandello, Italo Calvino, Giuseppe Tomasi di Lampedusa, Umberto Eco and many others. Retton, Mary Lou (b.1968) first female gymnast from outside Eastern Europe to win the Olympic gold medal in the women’s individual all-around competition at the 1984 Summer Olympics in Los Angeles, CA; elected to the National Italian American Sports Hall of Fame (1982). Rondinella, Annina Carmella (1865-1949) considered to be the first Italian American woman to receive an American medical degree. Rossi, Angela Carlozzi (1901-1977) born in Manhattan, New York, moved to Pennsylvania; became the first foreign born social worker for the Pennsylvania Society for the Protection of Children; served as executive secretary of the Italian Welfare League and head of its Immigration Aid department, from 1934-1973. Russo, Patricia (b.1952, Trenton NJ) first woman to become CEO of Lucent Technologies; currently serving on the Board of Directors of General Motors, Merck and Co. and Arconic, Inc.
Salamone, Sarah Cangialosi first woman to be elected as President of the Federazione Siciliana di New Jersey. Sanford, Leda (b.1933, Pieve Fosciana, Italy) came to the U.S and naturalized in 1939; an impressive career in editing, publishing, writing and administration for many well-known publications, such as Teens and Boys, Men’s Wear, American Home, Attenzione and Bon Appetit; the first female publisher of a major national magazine; influenced by Betty Friedan, Gloria Steinem, Emerson and Thoreau; a role model for women of all ages. Sansone, Mary Anna Crisallis (1916-2018) died at the age of 101; described by the New York Times as a “gutsy Brooklyn social worker who created a robust community service organization that bridged racial and ethnic barriers, defied the Mafia and befriended supportive politicians;” founder of the Congress of Italian American Organizations (CIAO) who spent many years in service to the Italian American community and to Italian immigrants. Scavaglione, Concetta (1900-1975, b. New York City) sculptor, Federal Arts Project artist and teacher; one of the founding members of the Sculptors Guild; the first woman to be awarded the Prix de Rome from the American Academy in Rome, allowing her to work there from 1947-1950. Segale, Sister Blandina (1850-1941) born in Italy and immigrated to Cincinnati at the age of four; joined Sisters of Charity at the age of sixteen and became an educator and social worker on the American frontier, having even met Billy the Kid; spent her life in service to the poor, the ill and the marginalized, such as Native Americans, Mexicans and Italian Americans in Ohio, Colorado and New Mexico, who also became involved in issues such as human trafficking and juvenile delinquency; the first individual in New Mexico’s 400 year history with the Roman Catholic Church to have a cause opened on one’s behalf for beatification and canonization. Smeal, Eleanor (Eleanor Marie Cutri) (b.1939) activist, grassroots organizer, lobbyist and political analyst; one of the major leaders of the modern-day American feminist movement; president and co-founder in 1987 of the Feminist Majority Foundation; served as president of the National Organization for Women (NOW) for three terms; in 1980, the first to coin the term “gender gap” in reference to the differences in male and female political voting and which has expanded in current use; her 1984 book How and Why Women Will Elect the Next President successfully identified a gender gap in politics. Sirey, Aileen Riotto, Ph.D. psychotherapist, who with Geraldine Ferraro, Matilda Cuomo, Donna DeMatteo, Bonnie Mandina and Roseanne Colletti, founded The National Organization of Italian American Women (NOIAW) in 1980 in New York City; served as its first president for five years and as its chairwoman for about twenty-five years; and is chair emerita. Strollo, Joanne (b.Philadelphia, PA) first female national president from 1993-1995 of the Order Sons of Italy in America (OSIA), which was founded in 1905. Strozza, Kathleen first woman national president (2008-2009) of UNICO, the largest Italian American service organization in the U.S., founded in 1922. Tesoro, Giuliana (b.1921, Venice, Italy) came to America during the Mussolini era; an accomplished organic chemist with over 125 patents, most notably as inventor of flame retardant fiber, anti-static methods and permanent-press properties. Tiburzi, Bonnie (b.1948) in 1973, at age 24, became the first female pilot for American Airlines and was the first female pilot for a major commercial airline; only woman in her class of 214 new AA employees. Vignelli, Lella (1934-2016, b. Udine, Italy) architect, designer, CEO-Vignelli Associates, co-founder-Vignelli Designs; involved in the formation of Associazione per Il Disegno Industriale; among her many awards, received the National Design Lifetime Achievement Award (2003); examples of her work included in permanent collections of numerous museums; with her husband, Massimo, created several iconic designs, including the famous NY City color-coded subway map. Zerilli-Marimò, Mariuccia, Baronessa (1926-2015) born in Milan, an active philanthropist and supporter of the arts and Italian culture in New York City; a member of the Permanent Mission of the Holy See to the United Nations and several prominent boards, including the Frick Collection, the Board of Trustees of New York University and the National Italian American Foundation; in 1990, established Casa Italian Zerilli-Marimò at New York University, allowing for the creation of a self-standing Department of Italian Studies, now ranked one of the best in the country, where she served as Chair of the Advisory Board. NOTE: This listing has been compiled for educational and cultural purposes with the knowledge that there are numerous other accomplished Italian and Italian American women in America. It is a beginning. If you have any candidates whom you would like to submit for consideration of inclusion, please submit to IHCC-NY Public Relations Chair: Nancy Indelicato at naindel@hotmail.com. 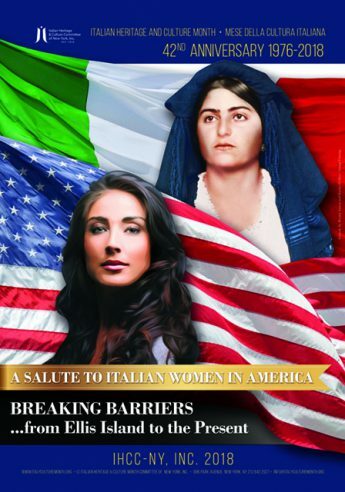 Consistent with this year’s theme, A Salute to Italian Women in America: Breaking Barriers…from Ellis Island to the Present, the candidates should be Italian and Italian-American women who are “firsts” and/or outstanding in their related fields of endeavor. Although the IHCC-NY, Inc., has taken all steps necessary to ascertain that the information in this listing is accurate, errors can occur. The IHCC-NY, Inc. assumes no responsibility or liability for any errors or omissions.